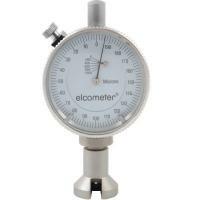 The Elcometer 123 Surface Profile Gauge is an easy to use gauge that measures the point-to-valley height of a surface. The average of a series of measurements provides an indication of the surface roughness and allows the surfaces to be compared. In summary, ASTM D 4417 Method B requires the mean of ten measurements to be calculated at an agreed series of locations, which characterise the surface. The gauge should be set to zero on a piece of glass prior to the measurements.